July 2011 – Share SharePoint Points ! I wana share another finding of BCS SharePoint 2010. So, its alternative I found was to bring the DateTime field data as string into the External List. Which worked well for me. Point to Site Actions, and then click View All Site Content. Click the Tabs in Search Pages list and click New and then Add New Item to add a new item that represents your new tab. Provide a name and associate it with the custom search page that you created earlier. Click the Tabs in Search Results list and and click New and then Add New Item to add a new item that represents your new tab. Click the Search tab to go to the Search Center. Go to the search result page. Point to Site Actions, and then click Edit Page. Find the search core result webpart and click on edit webpart. Find the “Scope” option under the ‘Location Properties’ section. Type your custom search scope name in scope section. Here is the screen shot of the property. Please feel free to ask any doubt about configuring search. A very general issue when working Sharepoint 2010 ​along with visual studio 2010 is getting this unhandled security exception. Though this error prompt will not affect much but still its anoying. Uninstalling Visual Studio will not resolve this issue. Hope you will get rid of this message after doing thid configuration. Sharepoint Logs not working with Error: Usage log retention limit reached. Some tools are available on codeplex which works well as a log viewer tools. I generally use SharePoint Log Viewer 2010 and SharePoint ULS Log Viewer. I have got chance to research on SharePoint Ribbon. I found few basics about the ribbon and implemented some of basic customization demos. For a beginner I think below demos are very helpful. I will first start explaining some basics of ribbon control. The Out-of-Box ribbon is rendered by a single Xml file resides in 14 hive at location …\14\template\global\xml\cmdui.xml. Now in order to customize this we have to override the functionality of cmdui.xml file or extend it the way we want. There are the several ways VS 2010 development tool provides us to create/deploy a xml file but I think creating a module is quite simple and professional way to implement. Tab: Tabs are the root of the Server ribbon. They contain one or more groups, and contain similar functions. For example, in Figure 2, the Page tab that is currently selected contains functions that pertain to working with the current page. Group:Every tab in the ribbon contains a series of one or more groups. Groups are used to associate controls with similar functionality. Each group is associated with a template that defines the layout of the group and how the group should appear based on the scale of the ribbon. The scale of the ribbon refers to situations where there are too many controls to show in the ribbon, for example, when the browser is not in a full-screen maximized state and is in a windowed state. Control:The ribbon would not be complete if users did not have anything to select or click. Controls are the items that live inside the ribbon that users can interact with. Controls reside within groups. These include things such as buttons, toggle buttons, check boxes, text boxes and many other controls. Contextual tab group:Contextual tab groups are used to provide functions that are not global to the current context, such as the page. They appear only when certain circumstances have been met and contain one or more tabs. A ribbon can have mutiple tabs, each tab mutiple groups and each group multiple controls. These controls can be a Button, CheckBox, Dropdown etc. The complete list is here: Button, CheckBox, ComboBox, DropDown, FlyoutAnchor, GalleryButton, Label, MRUSplitButton, Spinner, SplitButton, TextBox, ToggleButton. The CustomAction xml tag should have its Id in corresponding attribute – unique text value. The value for Location attribute should always be set to “CommandUI.Ribbon”, independently on what kind of ribbon customization it is created for. The CommandUIDefinitions tag should contain CommandUIDefinition child tags declaring all controls or containers which should be created (i.e. buttons, groups, tabs, etc.). All controls for this group can be declared directly in the Controls node inside the group declaration xml. There are two different ways that we define the custom action performed by the controls we placed under the custom tab/group/control. Site definition can be considered as a blueprint of a SharePoint site. When developing business solutions on WSS platform sometimes we will have to create our own site definitions to incorporate functional business modules. Site Definitions gives you lots of flexibility in terms of maintaining and upgrading your solutions compared to Site Templates. Its also gives us the flexibility of choosing custom layouts and the ability to pre program the sequence of the feature activation order when you create a new site based on the definition. 1) Open Visual Studio 2010, click New on the File menu, and then click Project. In the Templates pane, select the Site Definition project template under SharePoint 2010 templates folder. In the Name box, provide a name for your solution. In the Name box, input DemoSiteDefs and then click OK (See below Figure). 2) At this point, the SharePoint Customization Wizard will appear (See below screenshot).You will see a SharePoint Customization Wizard asking for a local site for debugging and deployment. Enter the URL for the SharePoint server site where you want to debug the site definition, or use the default location (http://system name/). 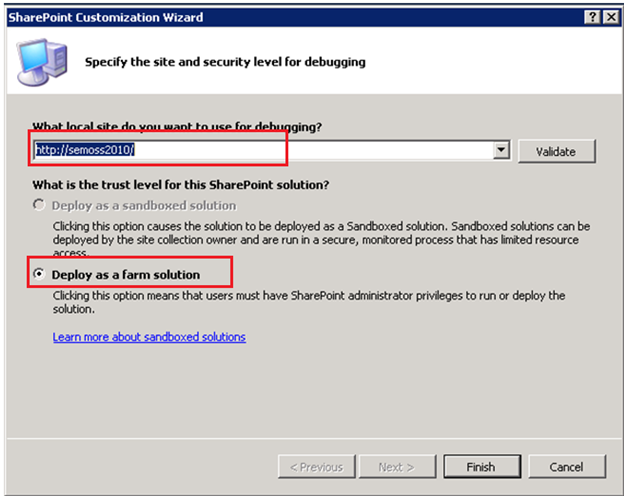 Select Deploy as a farm solution for “What is the trust level for this SharePoint solution?” Click Finish. The project appears in Solution Explorer. 3) Add MasterPage Module: To do this, right-click the project node in Solution Explorer, point to Add, and then click New Item.Within the Add New Item dialog box, in the list of SharePoint templates, select Module. Give the module a name, input MasterPageModule. In the module, delete the default Sample.txt file. Download starter master page from http://startermasterpages.codeplex.com/. Add the master page under the masterpage module. To do this, select the module node and then, on the Project menu, click Add Existing Item. Locate the master page and select it. Master page files have a .master file name extension. I added MyCustom.master file. See the following figure. Note: Please note that feature id should be replaced with your project feature id. Press F5 to run and deploy the project. Create a Site. In the new Site, you can see the custom master page as shown in the following figure.